When I first saw this recipe on Pinterest, I was a little unsure about it. I repinned it to revisit later. What I wasn’t sure about was how the bacon and the ranch would taste with pasta and cheddar cheese. Well, in my house, it was a hit. 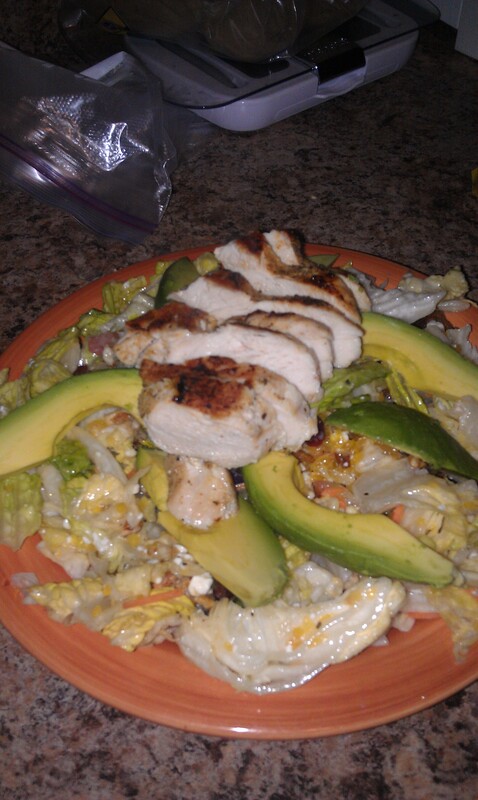 My hunny LOVED it. I know this because he went back for seconds. And then told me he would eat leftovers (Shock and amazement abounds)! What I really like about this recipe is that it used a majority of the remainder of the rotisserie chicken that I had bought in hopes of putting it on salads all week. Obviously my plan didn’t quite work out. And it’s a one pot meal! Oh yes, the other thing that i really enjoyed about this pasta is that it was cheap. I’m all about the low cost meals these days. Rachel Ray could totally feature this on thirty minute meals. So final thought, yay for a Pinterest meal turning out awesome! 1/2 cup shredded cheddar cheese – or more if you’re a cheese hound like me. 1. Prep your ingredients, aka chop the chicken and cook the bacon. And yes, you can cook the bacon in the microwave, I totally did. Thats the prep. Awesome, right? 2. Cook the pasta in boiling, salted water. Once it’s cooked, drain and set aside. 3. In that pot you cooked the water in, add the butter and melt. Then add 1 tbsp of the flour. Whisk… for you more experienced cooks, you’re making a roux here. Once everything is in a dough-y consistency, slowly add in your milk, whisking in to your doughy stuff. Make sure you break up all the clumps, that is what makes the sauce thicker. And here is where that other half a tbsp of flour comes in to play. The original recipe called for only 1 tbsp but I found that wasnt enough. Add it here and whisk. Let this cook for a few minutes on medium heat until it thickens a little bit… probably about 5 minutes. 4. Once you have a sauce coming together, add in the ranch seasoning, and the cheese. Stir it all together. You will find that you have a fantastically thick sauce now. Once the cheese is mostly melted, add in your chicken and bacon and toss to coat. Let this cook a couple minutes to heat up the chicken. 5. Add in your pasta, coat it with the delicious sauce, and let it warm back up for about 2 minutes. 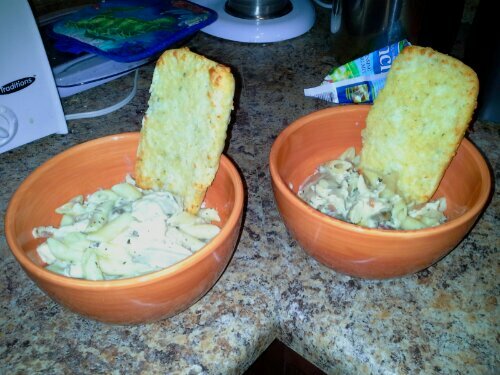 Serve with garlic bread and a salad to help balance out the meal. Final thoughts: this isn’t the healthiest meal we have ever had. But it is delicious, and everything in moderation, right? Sometimes you have to jump off the health food bandwagon for some good comfort food. And I’m betting this would be really good with some chopped broccoli added in. I was watching a show on the Food Network the other day, and the chef was making twice baked potatoes for a tail gate party. It sounded so good. Especially smothered in cheese! We all know how much I like cheese. Potatoes fresh out of the oven. They don’t look so pretty – I’m not sure how they ever would look so pretty. But it doesn’t matter because they are absolutely scrumptious! 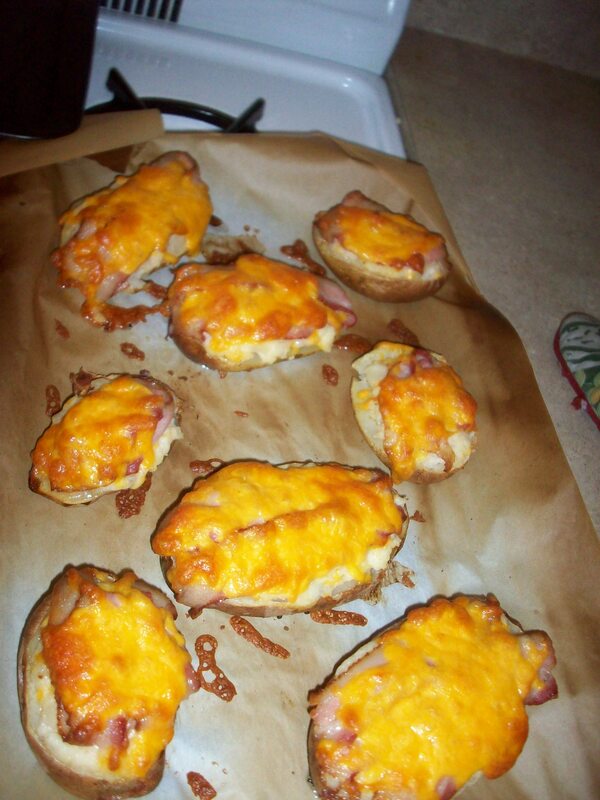 The basic concept for twice baked potatoes is to bake them once (duh!) at 400 degrees. Then you scoop out the middle, leaving just a tad of a border so they don’t fall apart, and mix the middle of the potato with good stuff, like cheese and chives and oregano. If I had the energy, I would have added sauteed onions and garlic with mushrooms to the mix, but instead I just added the dried versions. Bake the potatoes again for another 20 minutes until the cheese is golden – oh and did I mention the bacon? That makes it salty and crispy and more scrumptious. I think I died and went to heaven.